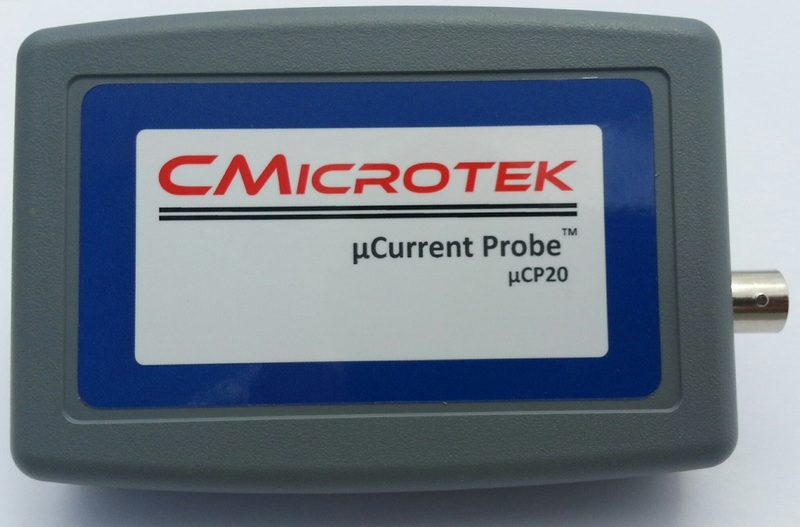 The CMictrotek µCP100TM and µCP120TM are state of the art analog current probes for taking precise current measurements in modern ultra-low current products. Our µCurrent Probes will save you development time while providing more accurate current measurements than traditional methods for measuring current. Check out Jack Ganssle's review of our µCP100 µCurrent Probe in the March 11, 2016 edition of his The Embedded Muse newsletter (under "Tools and Tips"). Our special thanks to Jack for taking the time to do this review. Check out the video of our µCP100 µCurrent Probe in action with a Link Instruments MS0-9212 on YouTube. Our special thanks to John Yeh of Link Instruments for putting together this video. With wide ranging current levels between sleep mode and full power mode, a sense resistor sized to give enough voltage drop to measure microamps on a typical oscilloscope in sleep mode drops so much voltage your circuit stops operating in active mode. With voltage drops across the sense resistor measured in millivolts or even microvolts, the signal level can be less than the resolution of even high-end digital oscilloscopes. With signals of such low amplitude, the accuracy of the measurement can be severely impacted by the accuracy of your oscilloscope. In recent years the major oscilloscope manufacturers have all focused on speed - faster and faster sample rates and features useful for high speed circuits such as eye diagram analysis. However, even digital scopes costing over $10,000 typically use 8-bit or 10-bit A/D converters which greatly impacts their voltage measurement accuracy in the ranges commonly used for low-current measurements. In fact, most low-current measurements taken with an oscilloscope use the worst combination of settings for accurate measurements - capturing at low volts per division and viewing at high magnification. The images below show a portion of a current waveform captured on a popular mid-range oscilloscope with the the "standard" probe for the scope and a sense resistor. The waveform was captured and displayed at 10mV/division (the scope's lowest volts per division setting) and 1mV equal to 1mA. This waveform shows the current draw from a lithium-polymer battery for an 8-bit micro as it wakes up from a sleep state, performs a timer based background task and then returns to sleep. It also illustrates some of the measurement problems typically encountered trying to measure low current levels without specialzed tools. To accurately analyze waveforms such as this with an oscilloscope you have to amplify the current waveform so that it can be captured and analyzed at a much higher volts per division setting. The image below shows the same waveform captured on the same scope using the CMictrotek µCP100. This time the waveform was captured and displayed at 5V/division and 1V equal to 1mA. The waveform is much cleaner so the waveform can easily be analyzed and the measurements correspond within a few percent to the expected current draws based on the datasheet specs for devices in the circuit being tested. 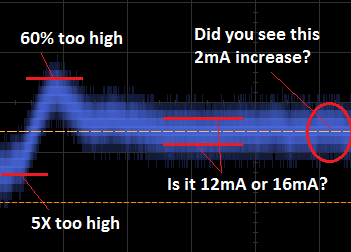 Keep in mind the current range in this example is fairly narrow, only 16mA peak current down to 230µA sleep mode current. A WiFi device with a modern 32-bit micro could have a range from several hundred milliamps down to tens of nanoamps. The table below compares the setup and measurements between the "standard" probe with sense resistor and the µCP100. This illustrates the importance of amplifying the current waveform so that it can be displayed and analyzed more accurately. For most digital oscilloscopes using 8-bit A/D converters, at their lower volts/division settings a voltage measurement may have an error of 30-50% of the volts/division setting. That means at 10mV/division their voltage measurements may be wrong by 3mV to 5mV. 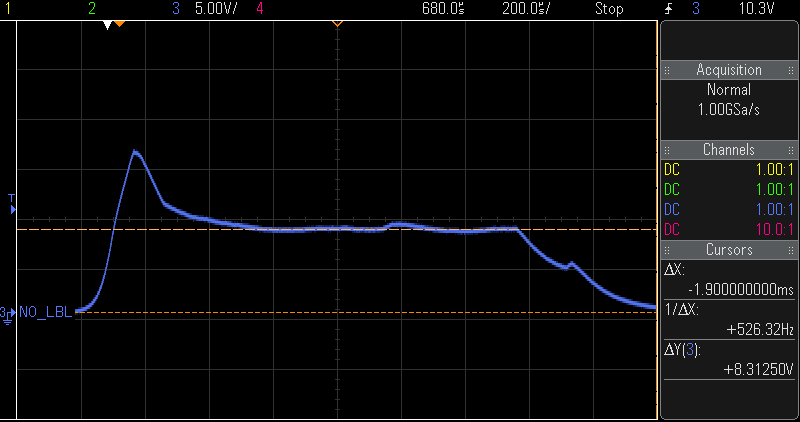 At the higher volts/division settings their voltage measurement error is much better but may still be around 5%. Given the measurements with the "standard" probe in the example above, an engineer could spend several frustrating weeks trying to improve an operating current that measures 2X too high and sleep current over 10X too high compared to the micro's current specs (7-8mA while operating, 230uA in sleep mode) when in reality the currents are what they should be. Even worse, a company could go to market with a product with half the advertised battery life. See our whitepaper "Accurate Current Measurements with Oscilloscopes" for a more in-depth discussion on this topic. 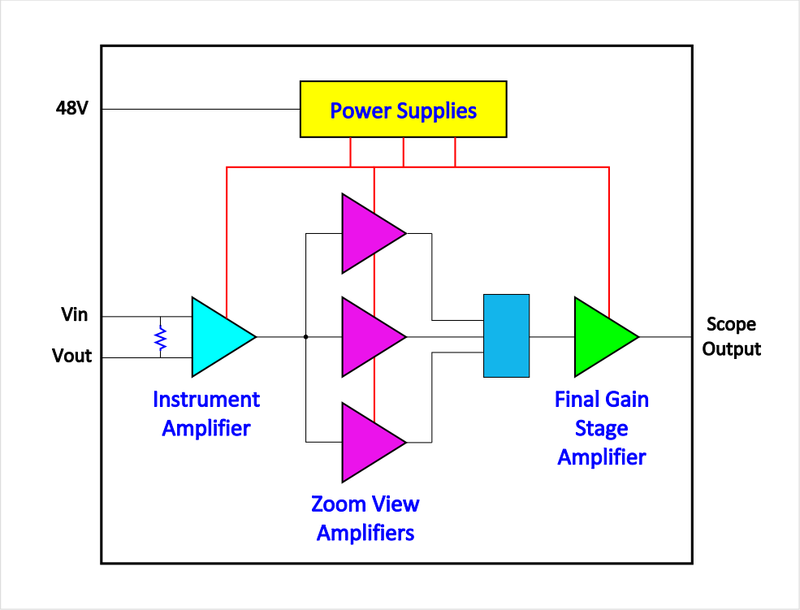 The µCurrent Probes employ three stages of amplifiers as shown in the block diagram below. The parts used in each stage were selected for the best performance for the input and output voltages required at each stage. The front end instrument applifier for example works with input voltages up to 20V and can measure a voltage across the sense resistors as low as 35µV allowing for the use of relatively low value sense resistors for improved accuracy and minimal voltage "burden" on the target system. The multiple power supplies allow for input voltages from ground to 20V and the 40V output allows for analyzing very wide ranging currents. The ability to measure ground current means the µCurrent Probes can be used for circuits with hundreds or even thousands of volts where high-side measurements would be impractical or dangerous. The µCurrent Probes feature switch selectable measurement ranges down to as low as 5nA. Few current probes on the market today can even measure currents below 100mA. The “precision” current probes that can measure below 1mA cost several times more than the µCP100/µCP120 and have proprietary scope interfaces so they must be used with the manufacturer’s oscilloscopes to access all their features. The µCurrent Probes can be used with any scope with a standard probe BNC connector. The µCP100/µCP120 feature a switch selectable “Zoom In” view to enable more accurate measurements with mid-range and low-end scopes and a “Zoom Out” view for times when seeing the entire waveform is more important than precise measurements. Wide input voltage range Input voltages up to 20VDC for use with 12V lead-acid battery, solar cell or “high” voltage energy harvesting power sources. Can also be used with “low” voltage energy harvesting power sources with a few hundred millivolt outputs or for measuring ground current. 0 to 40V output swing Wide output range simplifies taking current measurements and allows use of lower resolution oscilloscopes. Wide dynamic range The 8,000:1 current range in normal mode allows for use on devices with wide ranging current draws between active and sleep modes. Switch selectable ranges Two levels of resolution to match the measurement requirements. Internal/external current sense resistor The internal current sense resistors can be bypassed so that a resistor on the board under test can be used, allowing the user to adjust the current range to their specific needs. Switch selectable “normal” and zoom views The "zoom in" amplifies the signal by 10X to allow use with oscilloscopes with 8-bit or 10-bit A/D converters without compromising measurement accuracy. The "zoom out" reduces the signal by 10X for increased dynamic range. The µCP100 and µCP120 are in production and shipping, click here to purchase. 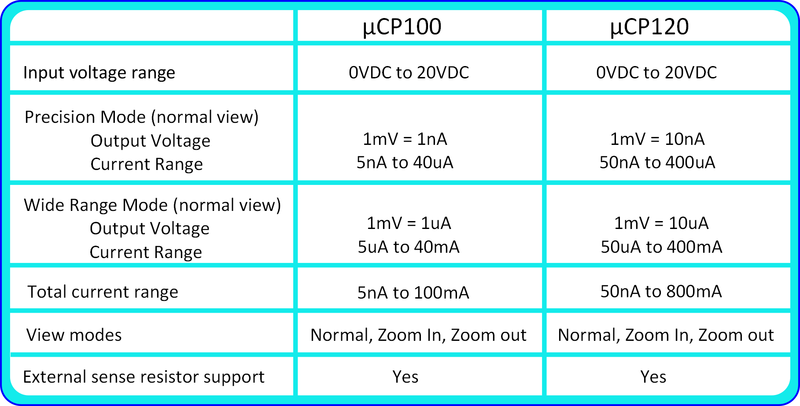 Click here for the µCP100/µCP120 data sheet. Click here for the µCP100/µCP120 manual. Building on the success of our µCP100/µCP120 µCurrent Probes, the µCP20/µCP25 offer current ranges and a reduced feature set that make them ideal for engineers that don’t require a full featured, ultra-low current probe as well as for serious hobbyists and the educational and Maker markets. Based on the same signal chain components as the µCP100/µCP120, the µCP20/µCP25 offer a low price-point without sacrificing measurement accuracy. The µCP20/µCP25 feature a switch selectable internal sense resistor or an external sense resistor. This gives the user the option of simple operation with the internal sense resistor or tailoring the sense resistor value to their specific needs. In external sense resistor mode, the maximum current limit is primarily based on the voltage drop and power rating of the resistor and the maximum output voltage of the probe. Wide input voltage range Input voltages up to 20VDC for use with 12V lead-acid battery, solar cells and even small 12V DC motors. Can also be used for measuring ground current when high-side measurements aren't practial or safe. 0 to 20V output swing Wide output range simplifies taking current measurements and allows use of lower resolution oscilloscopes. Wide dynamic range Over four decades of current range in internal sense resistor mode allows for use on electomechanical devices with wide ranging currents. Internal/external current sense resistor The internal current sense resistor can be bypassed so that an external sense resistor can be used, allowing the user to adjust the current range to their specific needs. 5VDC USB power connector Internal voltages are generated from 5VDC, avoding the need for an expensive external AC/DC power supply. The µCP20 and µCP25 are offered as the probe and target harness only or as a kit with BNC-BNC cable, 5V wall-plug power supply and PSB100 breakout board. The µCP20 and µCP25 are in production and shipping for US based customers, click here to purchase. 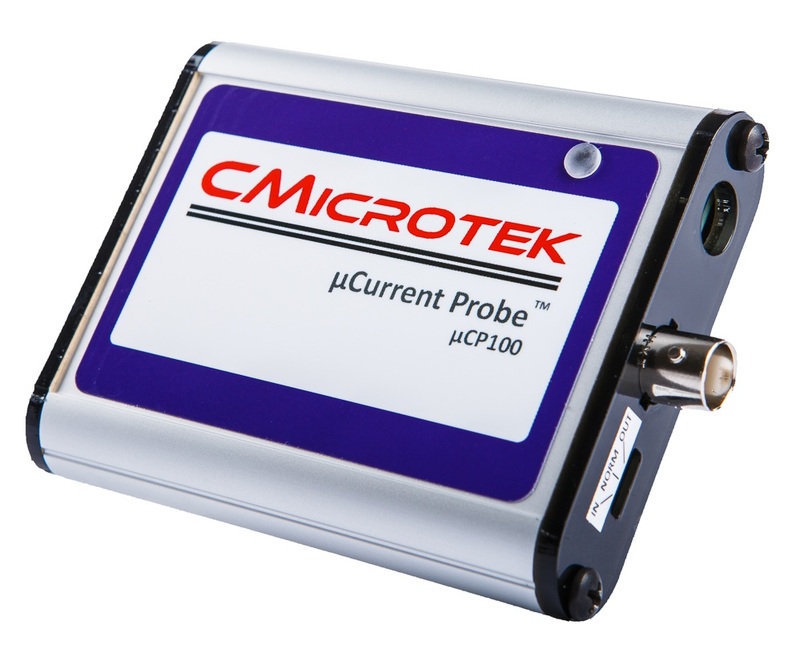 The CMictrotek current probes make taking accurate current measurements simple compared to other methods. To make using our products even easier we offer the PSB100TM Power Supply Breakout Board. This breakout board lets you avoid dealing with fragile small gauge wires and potentially shorting wires when working with boards that have not be designed for taking current measurements. Easy connection to a µCurrent Probe through a 4-pin 0.025” square post header. This allows the Target System Harness wires to plug directly onto the header or connect with micro/mini grabbers. Easy insertion into the voltage path with reliable connections. 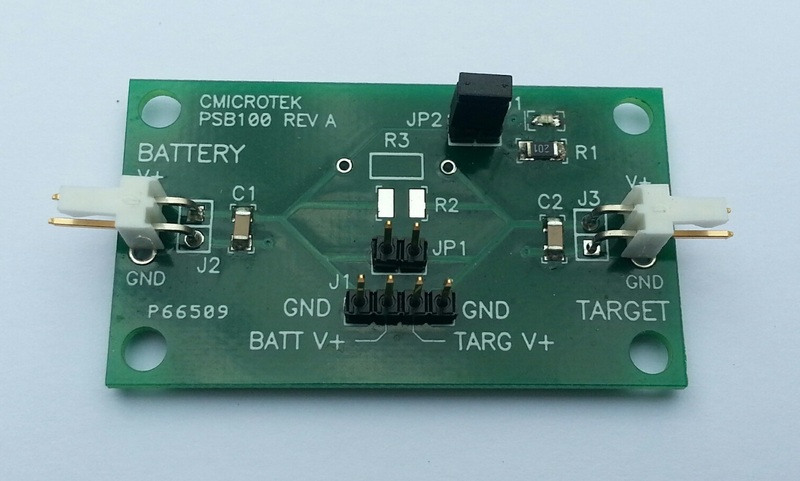 Can be used with the CMicrotek µCurrent Probe internal sense resistors or a customer supplied sense resistor on the Power Supply Breakout Board (through-hole or 1206/1210 SMT). On-board jumper to bypass the sense resistors to avoid excessive voltage drop across the sense resistor during a power-up current surge. LED indicates the power source is connected to the board (may be disabled via jumper for use with ultra low current energy harvesting power sources). Up to 2A high current path for use in a wide variety of applications. Click here for the PSB100 data sheet. The PSB100 is in production and shipping as a bundle option with a CMicrotek µCurrent Probe.